Use the Employee Termination of Domestic Partnership Form for your employees who are terminating a living arrangement that affects their company insurance plan or other company benefits. weeks looking at all the others, I found this has to be the best, for ease of use and producing professional looking documentation. I really do not know where our company would be without it." This Domestic Partnership Termination Form is included in editable Word format that can be customized in Word or by using the included Wizard software. Termination of Domestic Partnership Current Date. Please complete the following form, signing both employee and partner's names on each line, and return it to the Human Resources Department. NOTE: This Termination of Domestic Partnership Statement may affect any current coverage for your Domestic Partner and/or the rates you pay under any Company Insurance Plans or Company-sponsored benefits. I hereby declare that my former Partner, (please print), and I are no longer Domestic Partners and our Domestic Partnership ended on this date. 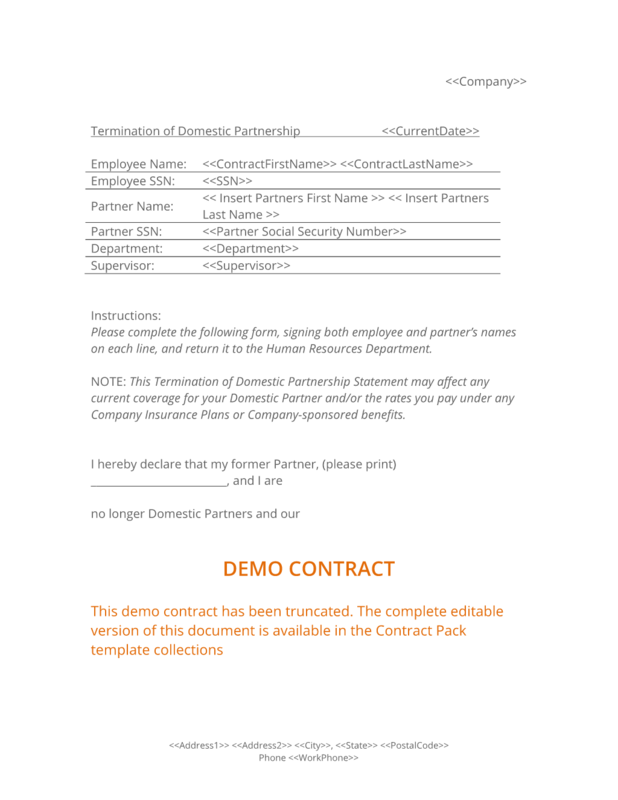 The complete Domestic Partnership Termination Form - with the actual formatting and layout - is available in this Contract Pack.